We were at the Musee du Louvre in the 1st Arrondissement of Paris, when we took these high definition photos showing a set of caryatids, which were sculpted by Astyanax Scaevola Bosio. 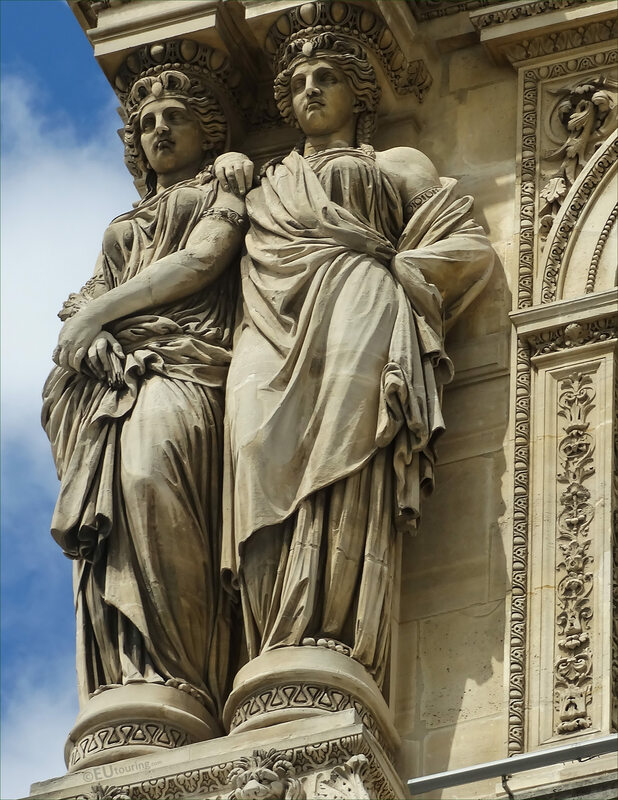 This first HD photo shows a set of two caryatids, spelt cariatides in French, and these were designed as female figures to provide architectural supports instead of standard columns, which is a feature that has been used on buildings such as temples for centuries. The name actually comes from the Greek term Karyatides, which literally means Maidens of Karyai and they would rejoyce with dancing while carrying baskets on their heads, so hence why they always support an entablature, that you can see here, yet the earliest preserved examples are the Caryatid Porch of the Erechtheion in Athens dating from approximately 421 - 407 BC. 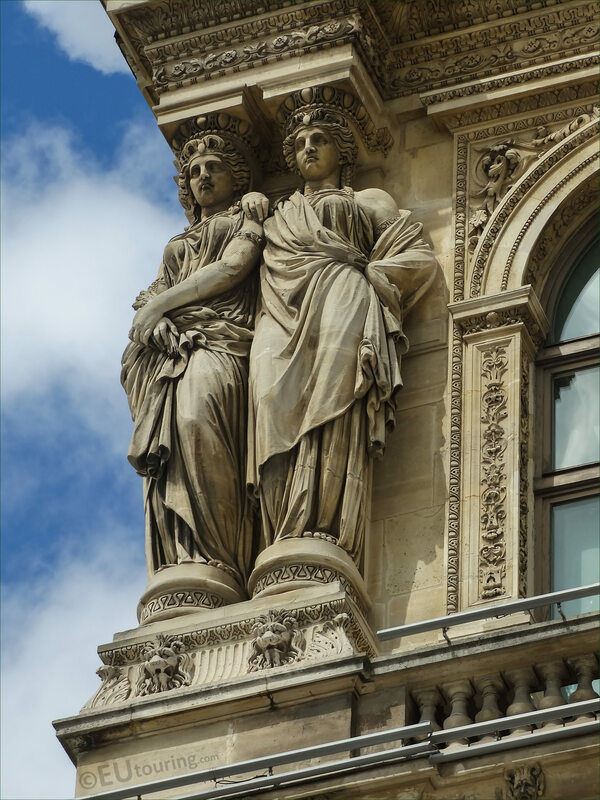 However, these particular caryatids are far more modern, as they were sculpted by Astyanax Scaevola Bosio for the former Palais du Louvre during the major restoration works, which were put in place in 1857, the same year that this French sculptor was awarded the Legion of Honour. But to provide a little more information about Astyanax Scaevola Bosio, he was born in Paris in 1793 and studied under his uncle, Francois Jospeh Bosio, to become a French sculptor, so he is often referred to as Bosio the Younger for this reason, and presenting works at the Salons, he received several public commissions for tourist attractions such as the Arc de Triomphe, Eglise de la Madeleine and of course The Louvre. 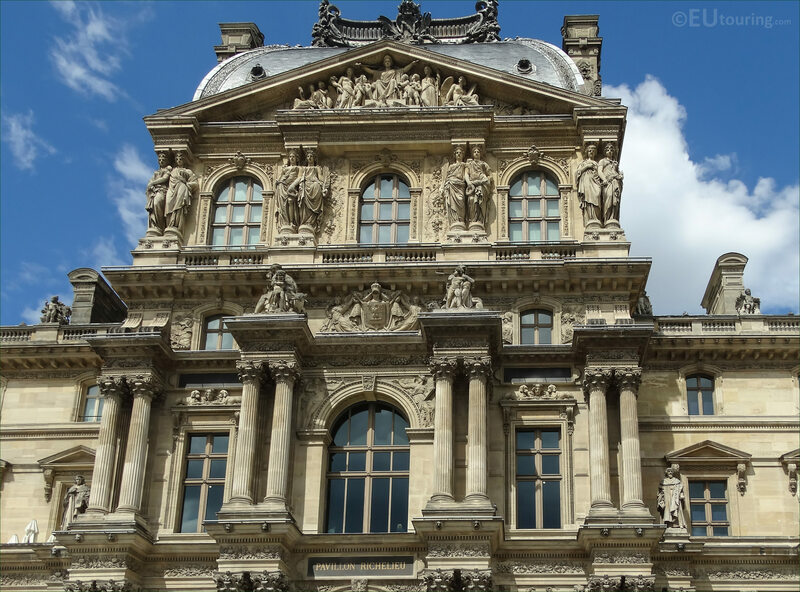 Yet here you can see the entire top section of the Pavillon Richelieu, which can be seen from the courtyard of the Louvre Museum called the Cour Napoleon, and when you are looking at this facade, you will see there are four sets of caryatids on the third level, and this particular set is to the far left hand side.